I’m sure that the category of “Nobody needs this” is larger than I can imagine – usually because I ignore stupid things. But last week I saw this in a store. Add one more thing to the list of items you will ignore in a garage sale soon. This entry was posted on Tuesday, September 23rd, 2014 at 9:30 pm	and tagged with Sock monkey, wine gifts and posted in Wine writing. You can follow any responses to this entry through the RSS 2.0 feed. So glad I kept my receipt. I don’t think it’s such a bad idea. At least it would keep the wine warm. I like that you have two thumbs. 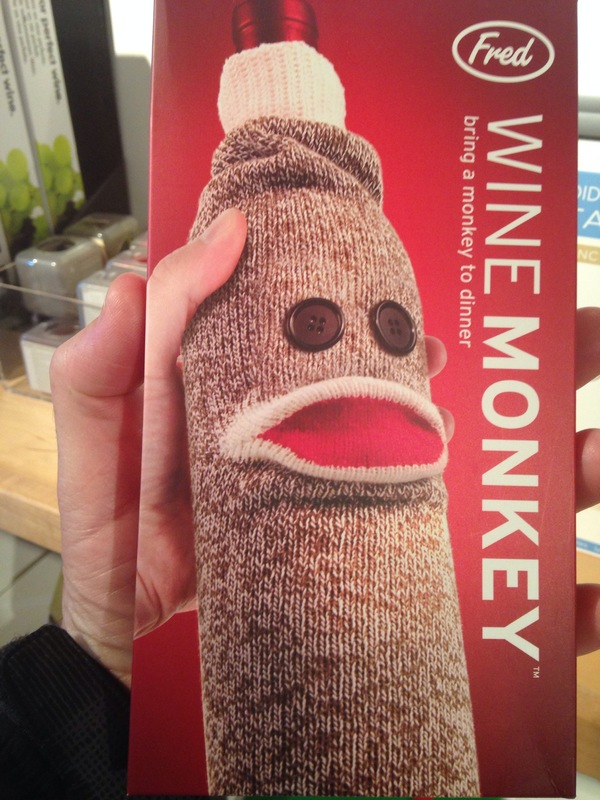 What a great idea, we have a sock wine night every Friday and this is something we have all been looking for. Can you buy one next time you see it and post it to me in Australia!! No wait, don’t hold your breathe.